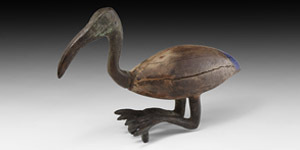 A recumbent ibis with carved ovoid wooden body with lateral folded wings, applied pigment to the rump; cast bronze legs and head, legs folded under the body with claws spread, attachment pegs to the underside; S-curved neck with ridged detailing and long curved beak. 210 grams, 15cm (6"). Fine condition. Property of a Swedish collector; acquired in 2010 from David Aaron Gallery, Berkeley Square, London, W1; formerly part of a private collection in Paris since the 1970s; accompanied by a copy of the original David Aaron invoice.